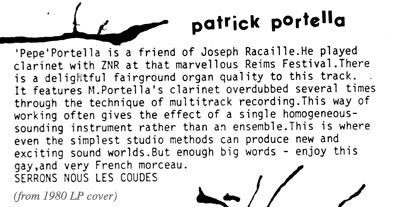 Well, as you can tell from the original sleeve note above, I didn’t know too much about Patrick Portella’s origins, experiences, goals and successes. 32 years on, I’m afraid I still didn’t know a lot more until I found his web site in French (easily translated into English via Google). He seems to be very active, creating rich musical soundscapes for theatre, radio, cultural festivals, and so on. The links at the top of the page allow you to access numerous lengthy soundfiles of his work, encompassing a variety of sound collage, world music,ambient music, etc. I found this project particularly interesting as it apparently includes the voices of Einstein and Rabindranath Tagore, and was performed in France and on tour in India. The handsome photo on Patrick’s website shows a man with a Gurdjieffian type vision, who seems to be looking deeply both outwards and inwards at the same time. No surprise then to discover that his projects now feature Asian, spiritually-oriented music with the emphasis on chant and percussion. I really recommend exploring the links on his site, it is not often one can get to hear so many extended works of this kind for free. Chanson is also part of the picture. 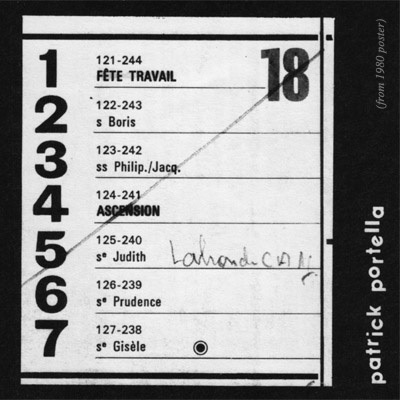 This radio work of Patrick’s has the French title “Que reste-t-il de nos amours?” and includes some very old popular French recordings. Charles Trenet was the man who wrote and recorded the song bearing this title, and due to his being a wartime favourite in England, my parents had several of his 78’s, which I played often as a child, marvelling at the exotic yet tender voice and sparkling arrangements that emerged scratchily from the grooves. Patrick was one of the Miniatures artists that came and went in a swift but pleasant passing (by the way, the title of his cheerful track means “Shake Our Elbows”) and our paths never crossed again. I sometimes look back and wonder if, had I stayed in England, Miniatures would have been the door to many fine musical collaborations. Quite possibly it could have been, but life took me on a different journey, so my experience with many of the artists, as here, was a quick hello and goodbye – in fact with some (especially on Miniatures 2) there was no face-to-face meeting, simply a letter or two, or a few emails. Which of course makes me even more grateful for their participation as they may not have known me from Adam. Which brings us to eden. To be more precise, eden ahbez (he preferred not having his name capitalised). At the 17″ point in Patrick’s track is a phrase that reminds me strongly of the song “Nature Boy,” first recorded by Nat King Cole in 1947 and a remarkably prescient example of spiritual/new age related music. The story of the song and the man who wrote it (eden, a long-haired bearded robe-and-sandals wearing reclusive but free spirit) is fascinating and of course the song is beautiful and timeless. Kudos to Nat for recording it (8 weeks at #1 in the US!). Patrick’s song is beautiful, too, and reminds me of two things. One – a sampler – because it being many tracks played on the same instrument, could now be easily played in real time on a MIDI keyboard using clarinet samples (though of course with less subtle articulations than this all-natural version). Two – the sound to me resembles a calliope or fairground organ, an instrument I have always wanted to own. They are still being made, and if well-built can be heard up to half a mile away! Bon appetit – et merci, Monsieur P.P.! Next up: my heart belongs to dada!! !